Prepare to celebrate in 2020 the 250th anniversary of Rev. John Murray preaching his first Universalist sermon in America. Get ready for a year-long celebration! 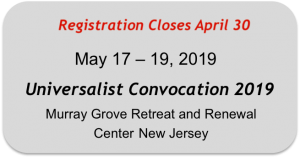 The Universalist Convocation is a member organization. Become a member today. Subscribe to the oldest continuously published liberal religious periodical in North America. The Universalist Herald.